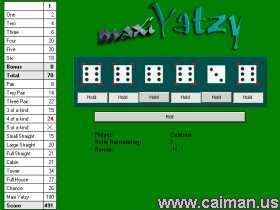 Caiman free games: Yatzy by Magnus Holen. 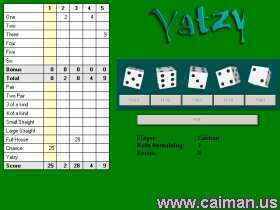 Yatzy is the Scandinavian version of the Yahtzee dice game. You can play two variations of the game, standard Yahtzy or a 6 dice variation called Maxi Yahtzy. It features 3D animated dice, sound, up to 5 players and a top 10 highscore. Maxi Yahtz with its 6 dice is a nice change from the usual 5 dice game. The scores are much higher and more choices for scoring. Tree equal - The sum of three equal dices. For more complete scoring info please see the in game help file. If your tired of the 5 dice games try this game using the 6 dice Maxi Yahtzy instead of its 5 dice Yahtzy.